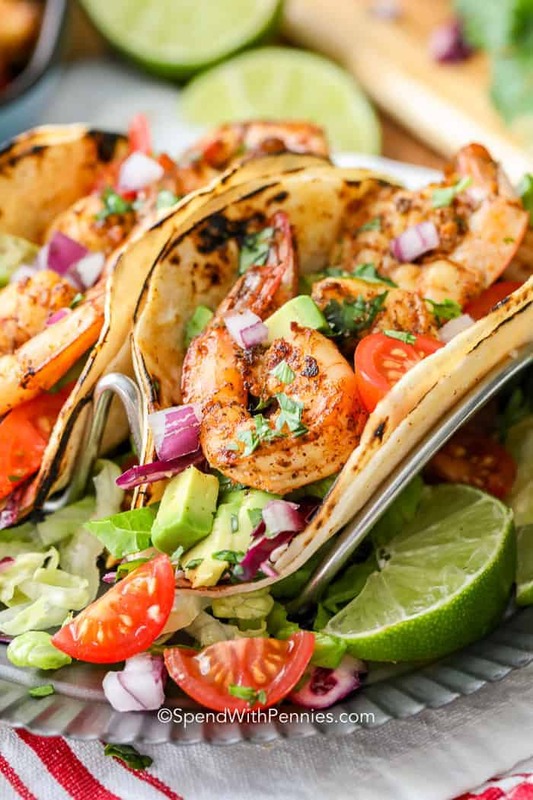 Shrimp Tacos are the perfect go-to for last minute get-togethers or kicking back at home with an almost effortless meal. Take a trip south of the border with this super easy take on a southwest favorite! Shrimp is a protein that is super fast to cook. Add in some fresh veggies like cabbage and slaw and you’ve got a meal in literally minutes! The shrimp taco seasoning is a snap to put together and can be used on fish too (for amazing Fish Tacos), so make extra to keep on hand! Instead of ordinary chopped lettuce, a tangy slaw with lime juice and mayo pulls the flavors together for a shrimp taco sauce that is muy bueno! Keep this easy shrimp tacos recipe somewhere safe because it’ll be a family favorite no matter what time of year it is! Most shrimp tacos with slaw are heavy on the mayonnaise, but this recipe has just enough cumin and garlic powder added to the mayo to bring out the full flavor of the spicy shrimp! 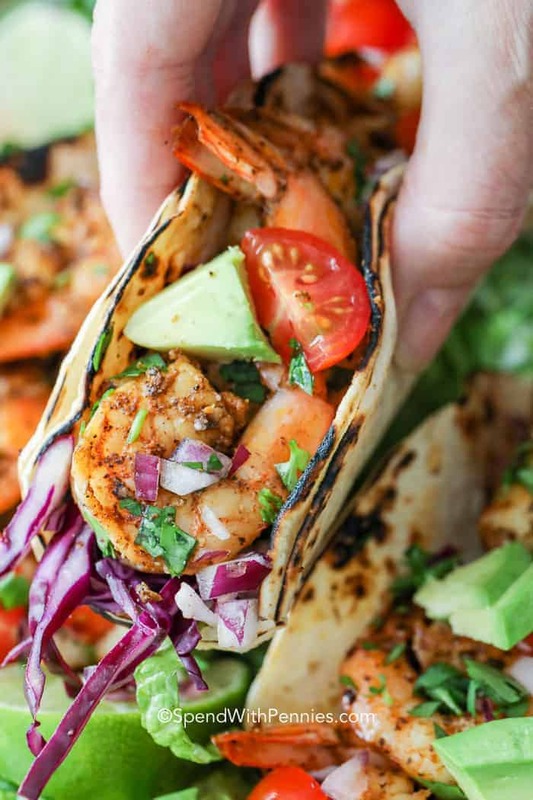 Grilled shrimp tacos just might be your new summertime favorite, we love serving them during patio parties alongside some sangria! For the best tasting slaw, prepare it well ahead of time and keep refrigerated so the flavors can all blend. Once the dressing is prepared, use only enough to keep the slaw coated but not soaking so it stays crisp and crunchy! Peel and devein the shrimp (and remove tails if desired). Mix with taco seasoning, garlic and lime juice. 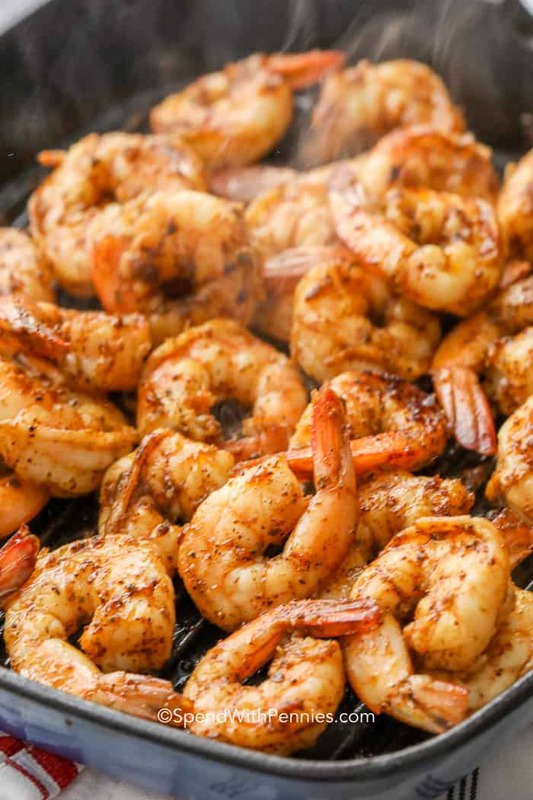 On a hot skillet or grill, cook shrimp until they are pink. Scoop slaw into each tortilla and add shrimp and desired toppings. Crazy easy right?! For a low-carb version, scoop slaw into a bowl and top with shrimp! What can’t go into a taco? Guacamole, sour cream, homemade salsa are great flavor enhancers! Olives, jalapenos, and cabbage or coleslaw all make great taco toppings no matter what kind of meat is used. Create a taco bar on the patio for your next get-together and let guests can build their own taco creations…get festive and have fun! Anything goes with tacos, making it a simple and fun dinner. For an appetizer, serve some tortilla chips with mango salsa and pico de gallo. Since these are Mexican inspired shrimp tacos, we add in rice and our favorite salad! For beverages, offer up some homemade mojitos, or a fun assortment of margaritas like mango margaritas, orange, or strawberry! These spicy shrimp tacos are the perfect go-to for last minute get-togethers or kicking back at home. Combine all slaw ingredients in a bowl. Refrigerate. Mix shrimp, taco seasoning, garlic and lime juice. Heat oil over medium-high heat. Add shrimp and cook 2 minutes, flip and cook an additional 2-3 minutes or until cooked through. Heat tortillas according to package directions. Fill tortillas with slaw, shrimp and desired toppings.